The assassination is still the subject of a lot of debate. There are a lot of conspiracy theories. Some researchers have suggested that Oswald was not the shooter. Others have suggested that he conspired with others to kill the president. Most of these theories accuse criminal groups, the military–industrial complex, the government of Cuba, the KGB, or the CIA. Lyndon Johnson, George H. W. Bush and Sam Giancana are among those accused. Only one person was ever put on trial: Clay Shaw, but he was found not guilty. 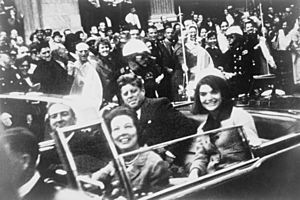 Assassination of John F. Kennedy Facts for Kids. Kiddle Encyclopedia.